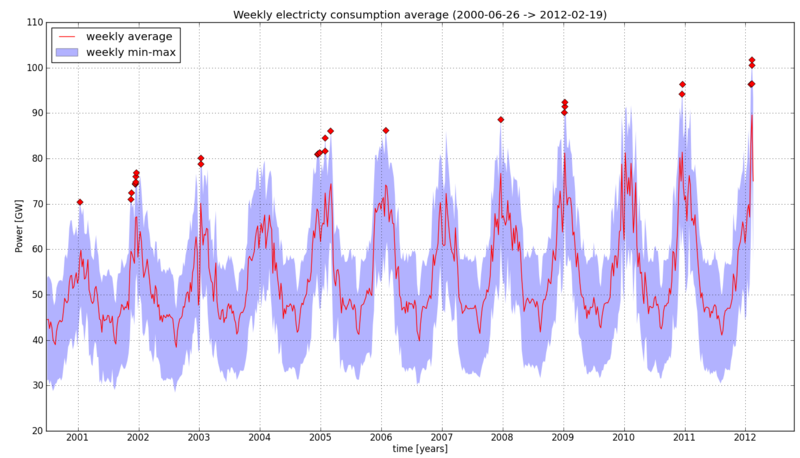 Thanks to the publicly available RTE éCO2mix data about French electricity, I was able to analyze the French electricity consumption since June 24th 2000 (15 minutes time-step averages), that is a bit more than 11 years. This is the first data analysis based on my éCO2mix downloading tool I announced a few days ago. It shows the tremendous increase (44 %) in the peak consumption value over this period. Note : tools (Python script) and data that generated these curves and tables are openly available on GitHub. To get a glimpse at what is going on with French electricity consumption, here is a plot over those 11 years. The read line shows weekly averages so that weekly and daily variations are smoothed out. The light blue shaded region which is the range between min and max consumption during the given week. This gives an idea of intra-week variability that the red curve doesn't show. The reason for this being roughly that there is a bigger need for heating and lightning during winter than during summer. Also, there is a general increasing trend. More precisely, one can see that consumption during summer is just slowing increasing, while winter demand is getting bigger and bigger. I will now illustrate this with the analysis of consumption records. I searched for successive records in the consumption data (starting June 2000). I found 27 records ("I" being my Python code...) which are all listed in the table below. All records (but one) happened around 7pm in winter, that is during the so called "evening peak", when people come back home and put both heating and lighting on (and start watching TV...). Also, all these records happened during weekdays other than Saturday or Sunday. This is related to the weekly pattern which contains a significant drop on weekends. This is +44 % increase in peak demand, which I feel is quite huge over this not-so-long period of 11 years. This requires the commissioning of new dedicated power plants to avoid black outs during winter. I'm not a specialist of this topic, but the basic idea is that this tremendous increase is French specific (if compared to similar European countries like Germany or UK). It comes from the fact that a high proportion of house heating is electric (around 30 %, and even more in new buildings). Each new building with an electric heating system is prone to be an additional peak load during winter, and they are a lot. And why do French people rely so much on electric heating ? Perhaps because of the price and also the culture of "cheap nuclear electricity". French regulated price for electrical energy is about 0.11 €/kWh for residential customers (including taxes). The regulated price has been frozen for some years by the French government to avoid angering people. Also, the installation cost of electric heaters is lower than of a fuel/gas based central heating system. However, in my opinion, French electricity price is bound to increase of maybe 30 % in the coming years, partly due to the need to either stop or rebuild nuclear power plants. It is sad that a lot of peoplee who will have to pay this extra cost where trapped in the first place by an artificially low electricity price. I've started writing simple tools (Python-based) to download this data set and then process it. As of now, these tools are openly available on a GitHub repository. Various custom plotting functions should follow. The real daily data files are available starting June 26th 2000, but those only contain the national electricity consumption, along with the D-1 consumption forecast. The detailed electricity production data (Nuclear, Hydro, Wind, ...) has been only available since about 2010, that is when the éco2mix application was launched.